In the Anglican Section of the Old Sydney (Devonshire/Sandhills) Burial Ground, was a very small headstone that marked the grave of Thomas Prior. The stone was embellished with several Masonic emblems and inscribed with the wording: Sacred to the memory of THOMAS PRIOR, who departed this Life, July 24th, 1836, Aged 88 Years, who Arrived in the first fleet 1788. Freemasonry has been associated with the British discovery and settlement of New South Wales from the beginning. 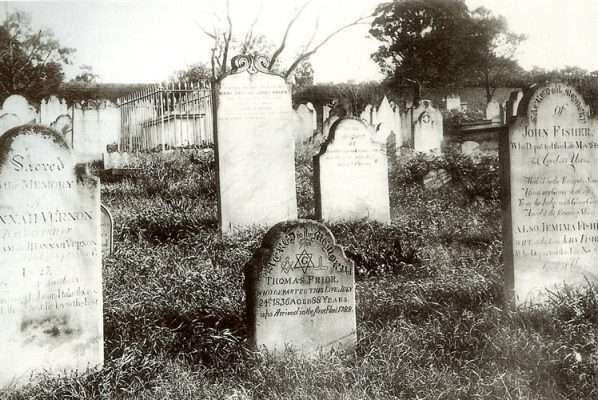 (With the redevelopment of the Old Sydney Burial Grounds, most remains and memorials went to Bunnerong Cemetery near the shores of Botany Bay). Thomas Prior had been sentenced to seven years transportation at Abingdon Borough Quarter Sessions on 16 January 1784 for theft of ten turkeys, thirteen fowls, five ducks, two geese two cheese cloths and one linen bag of the value of eleven pence of the goods and chattels of one William Walker. Spending time on the Censor Hulk he was sent by wagon on 24 February 1787 for embarkation on Alexander. 300 lashes was a very harsh sentence to be handed out to Thomas on 23 January 1789 for buying from William Radford a shirt, trousers and a pair of shoes as well as a pair of shoes from John Trace. Whether this was reduced or Thomas endured his punishment is not known, but a year later on 4 March 1790 he was one of many convicts sent by Sirius to Norfolk Island. During his time on the Island, he subsisted himself by clearing and felling timber on his Sydney Town lot. By May 1794 he was earning a living as a shoemaker. Thomas returned to Port Jackson by Daedalus in November 1794. On board Daedalus was Rebecca (Davidson/Davison) Holmes who was also returning to Sydney. She was the widow or former wife of Scarborough convict William Holmes whom she had married in Sydney Cove on 17 February 1788. Both were sent to Norfolk Island by Supply on 17 February 1789. Holmes, giving up his grant in 1792, left the Island by Pitt bound for Bengal India. Rebecca remained on the Island and earned a living by dressmaking. Rebecca Davidson was recorded as the wife of Robert Davidson when she was tried with Sarah Burdon on 25 October 1786 at the Old Bailey for feloniously stealing on 6 September 1786, three guineas, value 31.3s and one half guinea, value 10s. 6d, the property of Cabinet Maker Robert Taylor. Aged 28, with an occupation as Needle Work, Rebecca and Sarah were given seven years transportation. They were held over in Newgate Prison until being delivered to Lady Penrhyn on 6 January 1787. Thomas and Rebecca (as Rebecka Davison) were married at Sydney on 14 August 1795, although she was recorded in 1801 as Davison per Lady Penrhyn. Living in Sydney, Thomas had many trades over the preceding years. He was granted a liquor licence for a public house, held a lease for a town lot where he cultivated a vegetable crop, and operated as shoemaker employing one convict and gardener. It may have been during this period that Thomas entered the Ancient Order of Freemasons. Rebecca died in Sydney on 12 February 1805; her death was noted as Mrs Pryor in the Sydney Gazette, on 17 February and her burial recorded at St Philip’s Sydney. Listed in the 1828 Census of NSW, Thomas Prior aged 79, was a Gardner of Gloucester Street Sydney. Describing himself as a Labourer of Harrington Street Sydney, Thomas signed his Will with a mark, on 12 July 1834. He left all his property and personal estate to his executor, William Cains, licenced victualler of Sydney. Thomas Prior died at Princes Street Sydney on 24 July 1836, his death aged as 79; this differed to that on his headstone. His burial was registered on 26th at St James. The award winning 2002 Quadrant Building is part of the cove Apartment development fronting both Gloucester and Harrington Streets in the historic Sydney Rocks district. From Level 2 in the Quadrant Building, visitors can glimpse the remnants of First Fleet convict Thomas Prior’s Cottage (c1796) alongside other architectural building remains spanning the centuries.